GET EDUCATED: DO YOU UNDERSTAND WHAT ALL THIS SOPA/PIPA IS ABOUT? Who supports SOPA/PIPA? The US Chamber of Commerce, the Motion Picture Association of America and the Recording Industry Association of America all have unyielding support of this legislation. SOPA would allow the Justice Department to seek a court order to be served on search engines, Internet providers, and other companies that would force them to make a suspected piratical Web site effectively vanish from the Internet. The support for SOPA and an earlier version in the Senate called Protect IP is broader than Hollywood. A list of supporters includes the Association of Magazine Media, the National District Attorneys Association, the Romance Writers of America, Eli Lilly and Company, Kate Spade, Pfizer, Ralph Lauren, and a number of labor unions.That list appears on FightOnlineTheft.com, another Chamber project that urges visitors to “tell Congress to act on the rogue sites legislation immediately.” The Web site doesn’t highlight the U.S. Chamber of Commerce by name — instead, it’s described as a project of the Coalition Against Counterfeiting and Piracy, which is in turn organized by the Chamber’s intellectual property center. “I would assume that the Chamber’s members who support SOPA contribute more than those who are opposing it,” says Ryan Radia, an analyst at the Competitive Enterprise Institute, a free-market think tank in Washington. 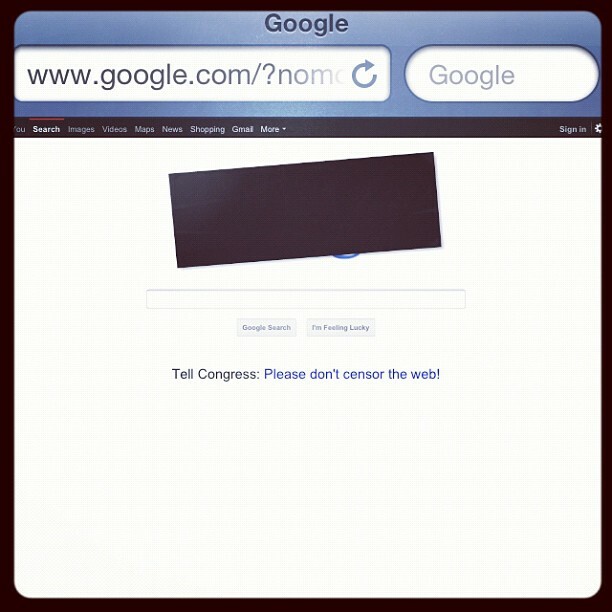 Are there free speech implications to SOPA? SOPA’s opponents say so–Laurence Tribe, a high-profile Harvard law professor and author of a treatise titled American Constitutional Law, has argued that SOPA is unconstitutional because, if enacted, “an entire Web site containing tens of thousands of pages could be targeted if only a single page were accused of infringement. What has the response to this language been? Web sites including Wikimedia (as in, Wikipedia) charged that SOPA is an “Internet blacklist bill” that “would allow corporations, organizations, or the government to order an Internet service provider to block an entire Web site simply due to an allegation that the site posted infringing content.” Tumblr “censored” its users’ content streams, and reported that its users averaged 3.6 calls per second to Congress through the company’s Web site–nearly 90,000 total. With a bit of HTML from AmericanCensorship.org, a Web site supported by the Free Software Foundation, the Electronic Frontier Foundation, and Public Knowledge, hundreds of Web sites “censored” themselves to protest SOPA. Even Lofgren, from Silicon Valley, has joined the fight-censorship protest. For their part, the Motion Picture Association of America (MPAA) has been highlighting an analysis it commissioned from First Amendment lawyer Floyd Abrams, a former MPAA attorney, who concluded SOPA is perfectly constitutional. How would SOPA work? It allows the U.S. attorney general to seek a court order against the targeted offshore Web site that would, in turn, be served on Internet providers in an effort to make the target virtually disappear. It’s kind of an Internet death penalty. How is SOPA different from the earlier Senate bill called the Protect IP Act? Protect IP targeted only domain name system providers, financial companies, and ad networks–not companies that provide Internet connectivity. Because SOPA is broader, even some companies who liked, or at least weren’t vocally opposed to, the Senate bill aren’t exactly delighted with the House version. What happens next? In terms of Protect IP, the Senate Judiciary committee has approved it and it’s waiting for a floor vote that has been scheduled for January 24. One hurdle: Sen. Ron Wyden, an Oregon Democrat, has placed a hold on the bill. During a two-day debate in the House Judiciary committee in mid-December, it became clear that SOPA supporters have a commanding majority on the committee. They’re expected to approve it when Congress returns in 2012. Where it goes from there is an open question that depends on where the House Republican leadership stands. Because the House’s floor schedule is under the control of the majority party, the decision will largely lie in the hands of House Speaker John Boehner and his lieutenants. Another possibility is that there could be further House hearings on the security-related implications of SOPA, a move that would delay a final vote. An aide to House Judiciary Chairman Lamar Smith previously told CNET that there’s no indication yet as to any further hearings, but after the committee debate in December, don’t be surprised if it happens. Interested in Protesting? If you are like me and against SOPA/PIPA, Google has a petition you can sign as part of their “End Piracy, Not Liberty” campaign https://www.google.com/landing/takeaction/. By signing the petition you are urging Congress to vote NO on PIPA and SOPA before it is too late. Feedback? Now that you have a better understanding on this legislation, what are your thoughts concerning this issue?